Join us for a healthier and more active 2019! For the third year in a row, the Milwaukee Bucks and the Froedtert & the Medical College of Wisconsin health network are teaming up to teach youth in our community the importance of living a healthy lifestyle. With the help of Bango, Milwaukee Bucks entertainers, and Froedtert & MCW professionals, four local schools will participate in Bango’s Bootcamp, a one hour assembly educating students and teachers on the importance of attendance, healthy eating, fitness and training. Students and teachers are encouraged to practice these keys to a healthy lifestyle for 30 days in a row in 2019! The Milwaukee Bucks and the Froedtert & the Medical College of Wisconsin health network are dedicated to helping improve the total health in the communities in which we live, work and play. We encourage you to take the first step toward your total health, whether you pledge to drink more water, swap your snack for a healthier alternative or commit to working out like the pros. You can try out our 30-Day Challenge too. Download the 30-day challenge documents to the rightbelow to get started today! The BUCKSFit Challenge presented by the Froedtert & the Medical College of Wisconsin health network is set to continue in its 3rd year at Fiserv Forum on March 23, 2019! Challenge yourself with friends and family in this fun-filled morning of fitness activities. Be one of the first to take a variety of fitness classes at the new Fiserv Forum led by Froedtert & the Medical College of Wisconsin health network professionals. Don’t miss out on this season’s BUCKSFit Challenge, space is limited and participation is first come first serve on the day of the event. Registration is full and now closed. Thank you for your interest in the BUCKSFit Challenge. Stay tuned for a recap of this seasons event and for future information on more BUCKSFit. Duane has over 11 years of experience as a licensed athletic trainer and performance enhancement specialist at the Froedtert & MCW Sports Medicine Center. He has a bachelor’s degree in athletic training and is a National Academy of Sports Medicine performance enhancement specialist and certified speed and agility coach. Duane served as the sports medicine intern for the Milwaukee Bucks from 2004-2006. As a Milwaukee native, he enjoys sharing his passion for fitness and injury prevention with the community. Becca is a licensed athletic trainer and certified strength and conditioning specialist with a master’s degree in athletic training. Becca has helped athletes increase speed, strength and agility while decreasing their risk of injury. She works with athletes of all ages and abilities and is passionate about keeping people healthy. Bryana is a licensed athletic trainer for the Froedtert & MCW health network. She serves as the athletic trainer at Hartford Union High School, where she provides coverage for the school’s athletic teams. She speaks to students in the school’s health and sports medicine classes and teaches injury prevention to student athletes. Outside of work, she enjoys hunting, spending time with family and teaching aerobics. The key to adding exercise to your lifestyle is not to try drastically changing your routine. If exercise is not currently part of your weekly routine, start off by trying to add 2 to 3 days of exercise for 45 to 60 minutes. In order to get the most out of your workout, try performing a combination of resistance training and cardiovascular exercise. Once your body has become accustomed to this, gradually increase your volume. For those working on resistance training, try a 3-day total body split or a 4-day split of two days upper body and two days lower body, plus cardiovascular exercise. To ensure that you are not overtraining, always listen to your body. You will experience some muscle soreness with exercising but it is important to know the difference between delayed onset muscle soreness (DOMS) and injury. DOMS is the pain and stiffness felt in the muscles several hours to days after strenuous exercise. This usually peaks between 24-72 hours after exercise and is often seen more in resistance training exercises with focus on the eccentric phase (contraction as muscle is lengthening). Light aerobic exercise and proper nutrition can help speed up muscle recovery. It is important to listen to your body when exercising because DOMS lasting longer than 3 days post exercise can deplete energy stores for up to 2 weeks. Some soreness is expected after exercise because of small scale damage in the muscle fibers as they adapt and become stronger. However, it's important to know the difference between muscle aches and joint pain. If you are experiencing pain that is deeper in the joint or not resolving, follow up with an orthopedic healthcare professional. If you are working out for a healthier lifestyle or to become leaner, do not become fixated on your weight. One common reason why people discontinue working out "post new year's resolution," is that after the initial weight loss or gains they see in the first 6 to 8 weeks from initial adaptations of exercise, they don't feel like they are making as much progress towards their goals, so they assume it is not working. However, this is assumption is not accurate because if they took circumference measurements, they would see that they are still making improvements. Remember that lean mass weighs more than fat mass, so there will be times when you may weigh the same but have a much leaner appearance. Also, to ensure you maximize your potential to reach goals, don't forget about your nutrition. A great free site to help with information on this is www.choosemyplate.gov. Before exercising, make sure you are aware of any pre-existing health conditions and always consult a physician. To estimate your maximum HR, use the equation 220-age. Once you have an estimate of your maximum HR, you can then apply training zones. 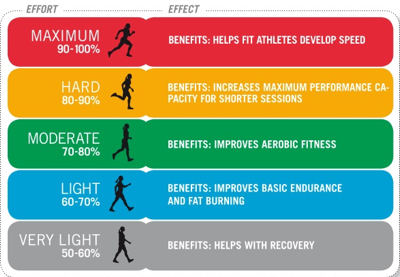 Notice that light training (60-70% of your max HR) burns the highest percentage of calories from fat. However, the number of calories you burn at this zone is minimal. This is why high intensity interval training (HIIT) is popular - you can burn a lot of calories in a shorter amount of time. HIIT involves short durations of exercise spent in higher training zones so that even while you are resting you are burn calories. Also, notice the very light training zone is useful for recovery. This will help with DOMS from higher intensity workouts. This could be an easy walk, jog, bike or swim. Athletes and exercise science professionals typically refer to this as an active rest period. Have FUN and do it for yourself! If you are having fun at whatever form of exercise you choose, you will stick with it. Remember that in addition to the many benefits of exercise, it is also providing you with a better chance to live a longer and happier life for yourself and those you care about. Love Live Life. According to the National Sleep Foundation, "Ninety percent of people in the U.S. admit to using a technological device during the hour before turning in." If you are one of those in the 90%, here are a few reasons that might make you want to be in the other 10%. It has been shown that using electronic devices before bedtime can negatively affect your sleep by overstimulating your brain. But how? Electronic devices (TVs, tablets, smartphones, etc.) emit artificial blue light. This blue light suppresses the release of sleep hormones making it difficult to fall asleep. Everyone needs a good night's sleep, so remember to always put your devices away at least one hour before bed! Do your research. If you are interested in trying a new exercise, check out multiple resources before executing it. Ask a professional. A Licensed Athletic Trainer or a professional who has knowledge in body movement is a reliable resource to have when trying new techniques. No pain, no gain. WRONG! This old saying is misleading and incorrect. If you are truly performing an exercise correctly, there should not be pain. Exercise should be difficult at times, but not painful. According to the National Athletic Trainers Association Position Statement, "Fluid Replacement for the Physically Active," the benefits of proper hydration include "maintaining athletic performance, maximizing the transfer of metabolic heat, maintaining mood, and facilitating recovery from exercise." While all of these things are important, this knowledge can be easily overlooked. It is shown that a majority of athletes (professional, collegiate, high school and youth) arrive at workouts under-hydrated. Here are some helpful tips to help utilize the benefits listed above. Hydrate before, during, and after exercise. Be mindful of body cues. Thirst, urine color, and body weight before and after exercise are good things to pay attention to when trying to stay hydrated. Staying hydrated is very important in keeping our bodies healthy. Water makes up about 60% of our body weight and is needed for almost every function in our body. Drinking enough water can help you perform better in sports, improve your mood, prevent headaches, and protect our bodies from chronic diseases like asthma. Try to drink mostly water instead of juices, sports drinks, or soda to reduce the amount of sugar and calories you consume. Chronic sleep loss can contribute to weight gain, high blood pressure, and a decreased immune system. You should aim for at least 7-8 hours of sleep a night. Having trouble sleeping? Use some of these sleep hygiene tips to help: cut out caffeine after lunch, get off electronics at least an hour before bedtime, establish a bedtime routine, and keep your room cool. Sleeping enough will help your body perform optimally. Our bodies were not made to be sedentary! Chronic diseases and weight gain are consequences of not moving enough. Many of us find it difficult to fit exercise into our daily routine. Start with baby steps to get moving and exercise more. Take small breaks during the work day to stretch and walk around, park farther away from stores so you will walk more, find a friend to exercise with, or wear your workout clothes to bed to help you get up to exercise in the morning. Although stress is a part of life, too much stress can wreak havoc on our bodies. Stress can lead to headaches, stomach issues, sleep disturbances, feeling overwhelmed or unmotivated. One easy way to combat stress is through deep breathing. Deep breathing slows your heart rate and can lower your blood pressure. Sit up straight and close your eyes. Place your hand on your belly. Begin to slowly inhale through your nose. As you inhale, feel your breath begin in belly and move up to your head. When you exhale through your mouth, reverse the process. Feel your hand move up and down on your belly as you breathe. Check out some more of Bango’s health tips that go beyond the 30-day challenge and encourage a healthy lifestyle all-year round!